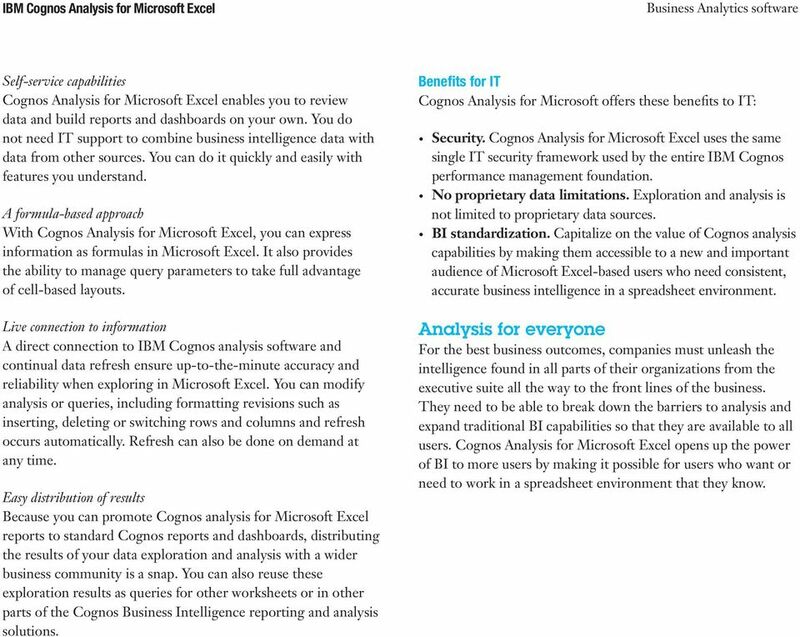 Download "IBM Cognos Analysis for Microsoft Excel"
1 IBM Software Group Data Sheet IBM Cognos Analysis for Microsoft Excel Highlights Explore and analyze trusted and secure BI data in a familiar spreadsheet format Develop high frequency and high priority use cases in Microsoft Excel using sanctioned corporate data Easily share results by promoting Cognos Analysis for Microsoft Excel reports, including new column and row calculations, to standard Cognos reports and dashboards Enjoy the freedom of self-service capabilities that let you analyze data from different sources without assistance from IT Overview IBM Cognos Analysis for Microsoft Excel brings the benefits of enterprise business intelligence (BI) to your Microsoft Excel spreadsheets. It provides a way for business analysts, financial analysts, line-of-business managers, users on the front line and others to take advantage of Microsoft Excel to perform analysis in a familiar format. Cognos Analysis for Microsoft Excel can apply the complete spectrum of Excel capabilities to your secure BI data to avoid multiple versions of the truth, data entry errors and security issues. 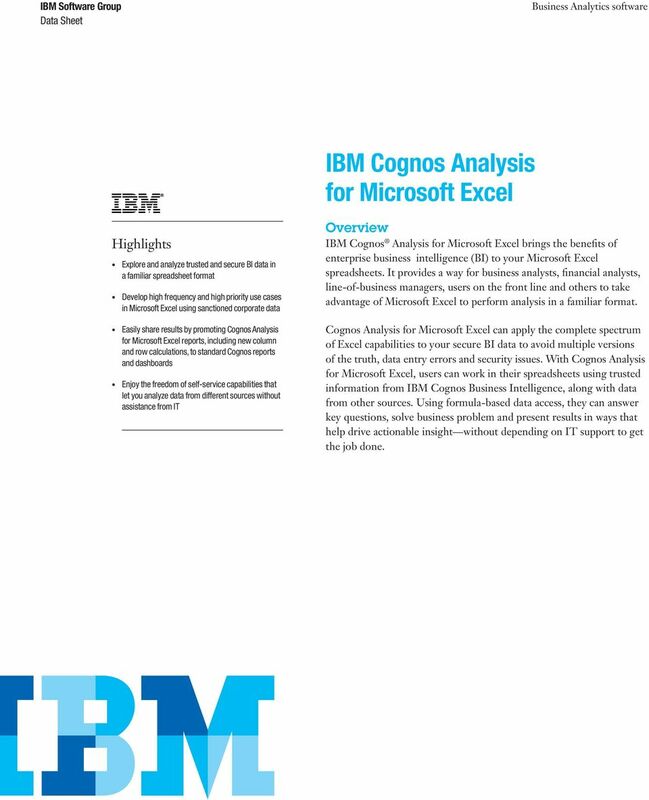 With Cognos Analysis for Microsoft Excel, users can work in their spreadsheets using trusted information from IBM Cognos Business Intelligence, along with data from other sources. Using formula-based data access, they can answer key questions, solve business problem and present results in ways that help drive actionable insight without depending on IT support to get the job done. 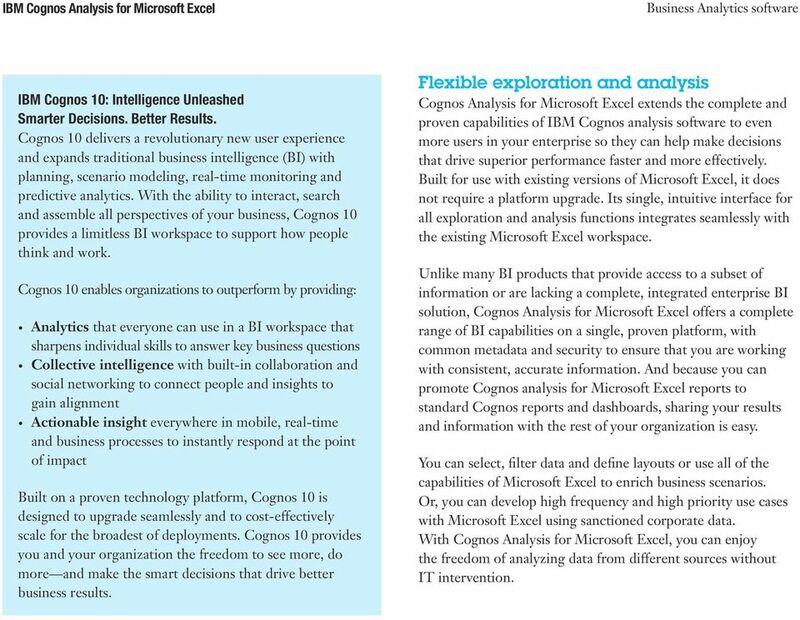 2 IBM Cognos 10: Intelligence Unleashed Smarter Decisions. Better Results. Cognos 10 delivers a revolutionary new user experience and expands traditional business intelligence (BI) with planning, scenario modeling, real-time monitoring and predictive analytics. With the ability to interact, search and assemble all perspectives of your business, Cognos 10 provides a limitless BI workspace to support how people think and work. Cognos 10 enables organizations to outperform by providing: Analytics that everyone can use in a BI workspace that sharpens individual skills to answer key business questions Collective intelligence with built-in collaboration and social networking to connect people and insights to gain alignment Actionable insight everywhere in mobile, real-time and business processes to instantly respond at the point of impact Built on a proven technology platform, Cognos 10 is designed to upgrade seamlessly and to cost-effectively scale for the broadest of deployments. Cognos 10 provides you and your organization the freedom to see more, do more and make the smart decisions that drive better business results. Flexible exploration and analysis Cognos Analysis for Microsoft Excel extends the complete and proven capabilities of IBM Cognos analysis software to even more users in your enterprise so they can help make decisions that drive superior performance faster and more effectively. Built for use with existing versions of Microsoft Excel, it does not require a platform upgrade. Its single, intuitive interface for all exploration and analysis functions integrates seamlessly with the existing Microsoft Excel workspace. 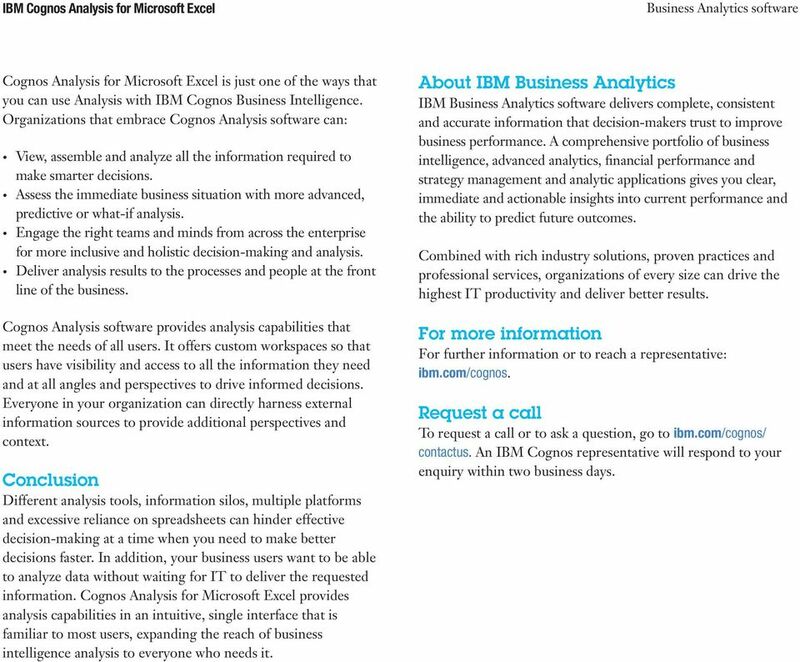 Unlike many BI products that provide access to a subset of information or are lacking a complete, integrated enterprise BI solution, Cognos Analysis for Microsoft Excel offers a complete range of BI capabilities on a single, proven platform, with common metadata and security to ensure that you are working with consistent, accurate information. And because you can promote Cognos analysis for Microsoft Excel reports to standard Cognos reports and dashboards, sharing your results and information with the rest of your organization is easy. You can select, filter data and define layouts or use all of the capabilities of Microsoft Excel to enrich business scenarios. Or, you can develop high frequency and high priority use cases with Microsoft Excel using sanctioned corporate data. With Cognos Analysis for Microsoft Excel, you can enjoy the freedom of analyzing data from different sources without IT intervention. 3 Features and benefits Cognos Analysis for Microsoft Excel makes it possible to analyze business data in a working environment that everyone already knows, offering benefits to both the business and IT. 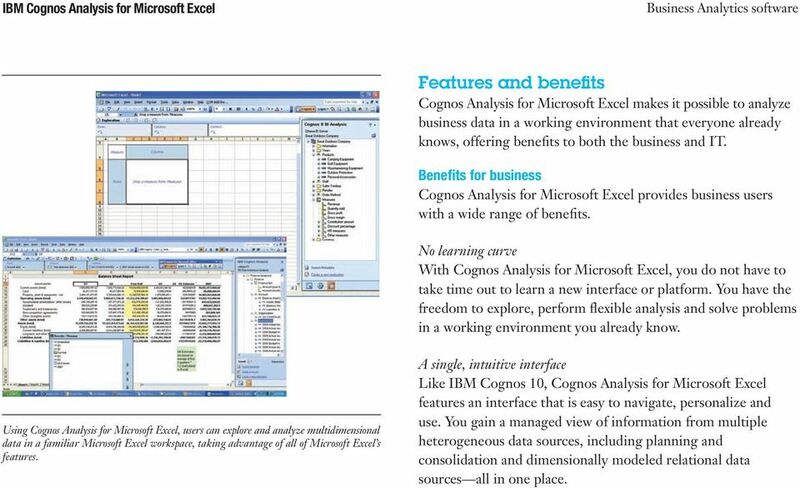 Benefits for business Cognos Analysis for Microsoft Excel provides business users with a wide range of benefits. No learning curve With Cognos Analysis for Microsoft Excel, you do not have to take time out to learn a new interface or platform. You have the freedom to explore, perform flexible analysis and solve problems in a working environment you already know. Using Cognos Analysis for Microsoft Excel, users can explore and analyze multidimensional data in a familiar Microsoft Excel workspace, taking advantage of all of Microsoft Excel s features. A single, intuitive interface Like IBM Cognos 10, Cognos Analysis for Microsoft Excel features an interface that is easy to navigate, personalize and use. You gain a managed view of information from multiple heterogeneous data sources, including planning and consolidation and dimensionally modeled relational data sources all in one place. 4 Self-service capabilities Cognos Analysis for Microsoft Excel enables you to review data and build reports and dashboards on your own. You do not need IT support to combine business intelligence data with data from other sources. You can do it quickly and easily with features you understand. A formula-based approach With Cognos Analysis for Microsoft Excel, you can express information as formulas in Microsoft Excel. It also provides the ability to manage query parameters to take full advantage of cell-based layouts. Live connection to information A direct connection to IBM Cognos analysis software and continual data refresh ensure up-to-the-minute accuracy and reliability when exploring in Microsoft Excel. You can modify analysis or queries, including formatting revisions such as inserting, deleting or switching rows and columns and refresh occurs automatically. Refresh can also be done on demand at any time. Easy distribution of results Because you can promote Cognos analysis for Microsoft Excel reports to standard Cognos reports and dashboards, distributing the results of your data exploration and analysis with a wider business community is a snap. You can also reuse these exploration results as queries for other worksheets or in other parts of the Cognos Business Intelligence reporting and analysis solutions. 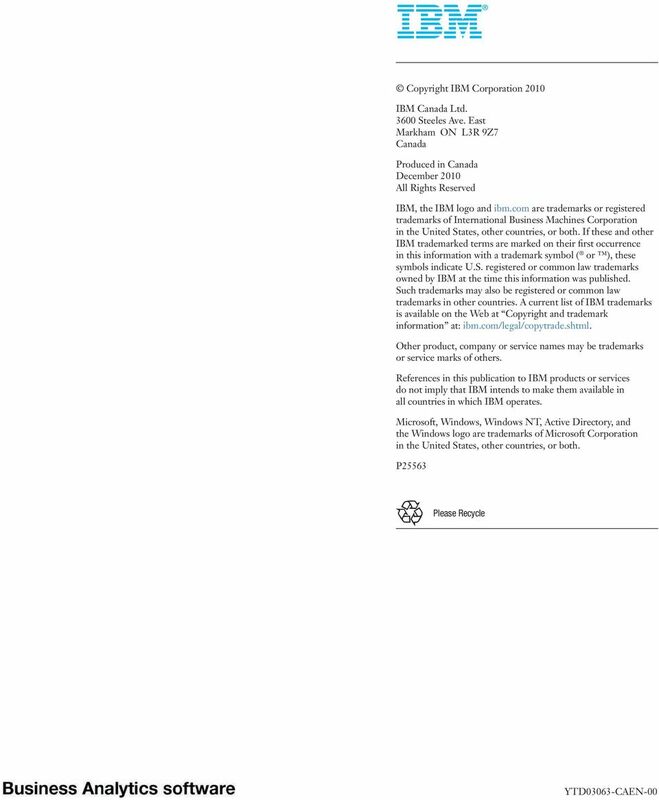 Benefits for IT Cognos Analysis for Microsoft offers these benefits to IT: Security. Cognos Analysis for Microsoft Excel uses the same single IT security framework used by the entire IBM Cognos performance management foundation. No proprietary data limitations. Exploration and analysis is not limited to proprietary data sources. BI standardization. Capitalize on the value of Cognos analysis capabilities by making them accessible to a new and important audience of Microsoft Excel-based users who need consistent, accurate business intelligence in a spreadsheet environment. Analysis for everyone For the best business outcomes, companies must unleash the intelligence found in all parts of their organizations from the executive suite all the way to the front lines of the business. They need to be able to break down the barriers to analysis and expand traditional BI capabilities so that they are available to all users. Cognos Analysis for Microsoft Excel opens up the power of BI to more users by making it possible for users who want or need to work in a spreadsheet environment that they know. 5 Cognos Analysis for Microsoft Excel is just one of the ways that you can use Analysis with IBM Cognos Business Intelligence. Organizations that embrace Cognos Analysis software can: View, assemble and analyze all the information required to make smarter decisions. Assess the immediate business situation with more advanced, predictive or what-if analysis. Engage the right teams and minds from across the enterprise for more inclusive and holistic decision-making and analysis. Deliver analysis results to the processes and people at the front line of the business. Cognos Analysis software provides analysis capabilities that meet the needs of all users. It offers custom workspaces so that users have visibility and access to all the information they need and at all angles and perspectives to drive informed decisions. Everyone in your organization can directly harness external information sources to provide additional perspectives and context. Conclusion Different analysis tools, information silos, multiple platforms and excessive reliance on spreadsheets can hinder effective decision-making at a time when you need to make better decisions faster. In addition, your business users want to be able to analyze data without waiting for IT to deliver the requested information. Cognos Analysis for Microsoft Excel provides analysis capabilities in an intuitive, single interface that is familiar to most users, expanding the reach of business intelligence analysis to everyone who needs it. About IBM Business Analytics IBM delivers complete, consistent and accurate information that decision-makers trust to improve business performance. A comprehensive portfolio of business intelligence, advanced analytics, financial performance and strategy management and analytic applications gives you clear, immediate and actionable insights into current performance and the ability to predict future outcomes. Combined with rich industry solutions, proven practices and professional services, organizations of every size can drive the highest IT productivity and deliver better results. For more information For further information or to reach a representative: ibm.com/cognos. Request a call To request a call or to ask a question, go to ibm.com/cognos/ contactus. An IBM Cognos representative will respond to your enquiry within two business days.